Seen steaming out of Loch Long this morning, was one of the Royal Navy's 'River' class offshore patrol vessels, HMS TYNE. One of three similar ships - there is a similar but modified fourth member of the class in service in the Falklands, HMS CLYDE - all built by Vosper Thorneycroft, these vessels are on a ten-year charter to the Ministry of Defence from their builder, with VT being fully responsible for maintenance and support during that period. Their double-chine hull is designed to keep hull resistance to a minimum, and they are supposed to be excellent sea-keeping ships. With a length of 79.5 metres and a displacement of 1,677 tonnes, they are driven by two Ruston diesel engines and controllable pitch propellers. With a speed of around 20 knots, they have a complement of 28. TYNE and her sisters are fitted with one 20mm gun and two GP machine guns. 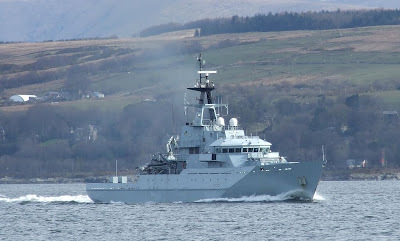 Their main role is fishery protection around the coast of England, Wales and Northern Ireland - Scotland has its own fleet of fisheries cruisers.